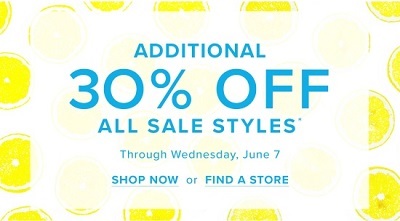 Get details about U.S. Vera Bradley extra savings! Still 2 days left when you can shop this amazing offer, so do not miss it out! Enjoy extra savings on all sale styles when you shop at U.S. Vera Bradley stores or U.S. Vera Bradley online. Take 30% off all sale styles! No coupon or promotion code needed to receive the offer. Offer is valid until Wednesday, June 7, 2017. For more details see any U.S. Vera Bradley store location or Vera Bradley online. (total: 225)G.H. Bass & Co.